The ancient system of Vedic Mathematics was rediscovered from the Indian Sanskrit texts known as the Vedas, between 1911 and 1918 by Sri Bharati Krsna Tirthaji (1884-1960). At the beginning of the twentieth century, when there was a great interest in the Sanskrit texts in Europe, Bharati Krsna tells us some scholars ridiculed certain texts which were headed 'Ganita Sutras'- which means mathematics. They could find no mathematics in the translation and dismissed the texts as rubbish. Bharati Krsna, who was himself a scholar of Sanskrit, Mathematics, History and Philosophy, studied these texts and after lengthy and careful investigation was able to reconstruct the mathematics of the Vedas. According to his research all of mathematics is based on sixteen Sutras, or word-formulae. Bharati Krsna wrote sixteen volumes expounding the Vedic system but these were unaccountably lost and when the loss was confirmed in his final years he wrote a single book: Vedic Mathematics, currently available. It was published in 1965, five years after his death. Click here to read about the life of Sri Bharati Krsna Tirthaji. Click here to access an audio recording of Sri Bharati Krsna Tirthaji. Click here to see an index for Sri Bharati Krsna Tirthaji's book. A copy of the book was brought to London a few years later and some English mathematicians (Kenneth Williams, Andrew Nicholas, Jeremy Pickles) took an interest in it. They extended the introductory material given in Bharati Krsna's book and gave many courses and talks in London. A book (now out of print), Introductory Lectures on Vedic Mathematics, was published in 1981. Between 1981 and 1987 Andrew Nicholas made four trips to India initially to find out what further was known about it. Following these journeys a renewed interest was taken by scholars and teachers in India. It seems that once they saw that some people in the West took Vedic Mathematics seriously they realised they had something special. St James' School, then in Queensgate, London, and other schools began to teach the Vedic system, with notable success. 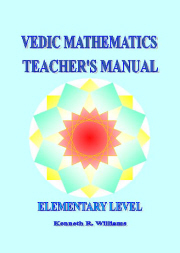 Today Vedic Mathematics is taught widely in schools in India and a great deal of research is being done. Three further books appeared in 1984, the year of the centenary of the birth of Sri Bharati Krsna Tirthaji. These were published by The Vedic Mathematics Research Group. This website first appeared in 1998 and the Vedic Maths Newsletter was started soon afterwards. At that time an Internet search for "Vedic Mathematics" and related phrases did not yield a single 'hit'. Now there are 700,000 links (on Google) and increasing. When Maharishi Mahesh Yogi began to explain the significance and marvelous qualities of Vedic Mathematics in 1988, Maharishi Schools around the world began to teach it. At the school in Skelmersdale, Lancashire a full course was written and trialled for 11 to 14 year old pupils, called The Cosmic Computer. (Maharishi had said that the Sutras of Vedic Mathematics are the software for the cosmic computer- the cosmic computer runs the entire universe on every level and in every detail). This course was published in March 1998 (titled The Cosmic Calculator). People who can perform astonishingly long or complex calculations in their head are often called calculating prodigies or lightning calculators. There are many examples from the past, from Jedediah Buxton who worked as a labourer and remained illiterate all his life to Karl Friedrich Gauss a mathematician who is ranked with Newton and Archimedes. Since Vedic Mathematics is the most efficient mathematical system it would be interesting to ask whether these calculating prodigies may have used it. It is peculiar to arithmetic that once the basic facts are understood any intelligent person can construct the whole science: number science develops in a totally natural way. This is what seems to have happened in most cases of calculating prodigies. From a basic understanding the young calculator realises that the power of their mind to calculate seems to be almost unlimited. Once they understand a problem they can solve it. Ampere was an amazing mental calculator at the age of three and Gauss at the same age corrected his father's mistake in a payroll reckoning. These people are self-taught, they construct their own methods of calculation. In some cases however the methods they devise are extraordinarily complicated, especially in view of the ultra-efficient methods of Vedic Mathematics. Jedediah Buxton, for example, could multiply huge numbers together in his head but seems to use the most awkward methods, multiplying parts of the number and adding them. This may not have been difficult for him as he had an extraordinary memory. He could remember many long numbers and recite them from the left, from the right or from any other point. He would also remember all the steps in a calculation for a long time afterwards. All mental calculators have a good memory and they make use of previous results they have found out. Some also work two or more figures at a time (a feature of the Vedic system, as is calculating from right to left or left to right). Calculating prodigies do not seem to necessarily always seek the most efficient method - only one that works and that they are happy with. But calculations can often become unconscious and the calculator cannot then describe their method. And furthermore what may have been an effective method can get altered and simplified with practice so that many calculating prodigies may be using Vedic methods without knowing it. When Bharati Krsna Tirthaji gave talks in India after discovering the Vedic system some people took advantage by learning the Vedic methods and giving demonstrations, sometimes pretending to be divinely inspired or to have the help of some spirit. This demonstrates the effectiveness of Vedic Mathematics as an efficient mental system. The Introduction to the book "The Natural Calculator" describes the many advantages of mental mathematics and the Vedic system and supports the view that everyone is potentially a lightning calculator.